Open your heart to the power of kirtan – mantras charged with dynamic rock, funk, gospel, and world grooves. 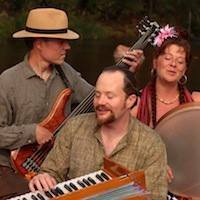 Sean Johnson And The Wild Lotus Band strike peoples’ hearts with their soulful, imaginative, and dynamic music that bridges the east and the west. Sing, dance, stretch and travel on a revelatory journey through myriad sounds, flavors, and languages including belly dance rhythms. Deepen your connection to spirit by merging the heart-opening qualities of bhakti yoga with the sensuality and vitality of asana. This playful all-levels practice includes storytelling from the mythical world of yoga, heart-felt kirtan chanting, graceful vinyasa sequences,imaginative meditations and evocative live music. Some experience with yoga is recommended. Sean and the band have guided this workshop at festivals and conferences across the country including sold-out attendance at The Yoga Journal Conference and Bhakti Fest. Bring crayons or magic markers. and putting a New Orleans and American stamp on kirtan. Free your heart and stir your soul in this evening of ancient mantras given new voice through dynamic songs that merge New Orleans roots, rock, gospel, and world grooves. Join New Orleans' Sean Johnson & The Wild Lotus Band for an evening of inspirational mantra music.Enjoy this dynamic concert for music lovers! a genre of spiritual music that originates in the yoga traditions of India. Their latest album Unity debuted #1 on the iTunes World Music Chart and #3 on the Billboard Chart. They are the first kirtan band to play The New Orleans Jazz Festival. 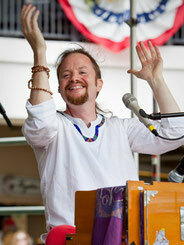 Sean Johnson, and The Wild Lotus Band have become one of the guiding voices of kirtan (chanting) music in America- a genre of spiritual music that originates in the yoga traditions of India. The lyrics are mantras,” explains Sean, a vocalist who also plays the harmonium. “It’s all energy based sound, sung to change our stage of consciousness.” As Western artists, we take the mantra from the yoga tradition and compose original music around it, so the blend is a rock-gospel-funk-folk. We are making music from the yoga tradition more accessible to people who are simply into music.” Their dynamic music has opened peoples’ ears and hearts. Facilitated by Sean Johnson and The Wild Lotus Band (Alvin Young and Gwendolyn Colman), who love to inspire people through a creative integration of imaginative music, yoga, storytelling, and poetry. Sean is the founder of The Wild Lotus Band, and also the founder of Wild Lotus Yoga studios in New Orleans, and Soul School, an interdisciplinary yoga and spirituality teacher training program that focuses on teaching yoga with skill and imagination. He has been leading kirtan for the last twenty years. CDs will be available for purchase.